On Monday 17th December, a fantastic turnout saw 16 players competing for the Turkey tournament title. A handicap tournament against the clock, the Turkey tournament ensured lots of games for everyone and gave everyone a chance of competing, regardless of ability. A tremendous final saw Danny Jnr beat Sam 32-31 with the last shot of the match. Well done Dan. Thanks Alistair for the prizes. Alistair won a close battle with Roger in the final. Thanks to Alistair for the prizes and Danny for organising. Thanks to Matt for organising and Stephens' butchers for sponsoring. Report. On Sunday 4th March 2012 St Ivo Racquets club resurrected the infamous 'Turkey' tournament. There was a very good turnout with 14 players of all standards battling it out for some Karakal squash goodies, and the ultimate prize of Turkey Tournament champion! Players were each given a handicap based on their ability, and games were timed at fifteen minutes. The player with the higher handicap was given a points start equal to the difference in handicaps, which ensured many closely fought matches. In the early rounds the tournament took on a round robin format. Danny Caulkett Junior progressed easily from his group, despite a scratch handicap his fierce shots were too much for his opposition but he survived a very close match with Gayle Jackson to win his group. He was followed into the semi finals by his father, Dan Caulkett Snr whose tireless running game was too much for his group opponents. Alex Curtis won his group with relative ease, seeing off a potentially tricky final opponent in Nick Bach to go through. The final semi final place was claimed by the returning Matt Dixon who went through after an epic tussle with Ian Pask saw him win the deciding group match 39-38. The first semi final between Dan Caulkett senior and Alex Curtis was always going to be a big ask for the older Caulkett. Giving away 13 shots to the younger player meant Dan was always playing catch up, and Alex saw the match through with a thumping 61-19 victory. The second semi final was an eagerly anticipated match between the competitions two best players Danny jnr and Matt. Matt had a five point advantage, and started well but Dan reeled the score back and smashed his way to a 34-26 victory. The final was an epic encounter. Alex had a 28 point advantage, and at at the halfway stage it looked like he could hold on for victory. Danny had a very good run of points and took the lead with two minutes remaining. However Alex was hitting some unstoppable forehand drives and got the score back to level with only 30 seconds remaining. Danny composed himself and managed to win the last two points to claim the title 47-45. Well done Danny and Alex for a great final. Every year before the AGM the club hold a team tournament. Players of all ages and ability are encouraged to enter. Teams are selected to include a player from each playing category (Advanced through to beginners), and players play against their opposite numbers from other teams. It is a great opportunity for all the club, team players, social players, and juniors to come together and play in a friendly, fun competition, where everybody gets to play players of a similar standard. Make your entry on the noticeboard. The final of the annual handicap turkey tournament took place on Monday 1st February. A large crowd was at the Ivo centre to witness a tense and exciting finale to the competition as the hard hitting Danny Caulkett Junior took on the skillful Steve Mason. Mason was awarded a 12 point handicap start by match referee Toby Reeves. Under the rules of the Turkey, Caulkett junior had 20 minutes to overturn the deficit in a continuous game of point-a-rally squash. Caulkett started well and reduced Mason's lead to eight points with ten minutes remaining. The two players slugged it out over the next five minutes in a game of high quality volleys, fierce drives, and exquisite drops. As the game progressed into the final five minutes, Caulkett started to find a good length with his drives and with two minutes remaining Mason held onto a slender lead of two points. 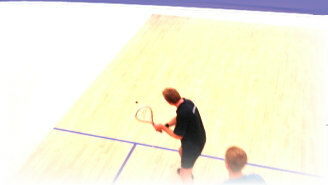 Both players refused to take a step back and an epic rally ended with Caulkett tinning an easy drop. The roar of frustration Caulkett emitted still echoes around the Ivo centre to this day. With victory in his sight Mason could have sat back and played for time, but to his credit he took the next point with a sublime dropshot to claim the title. Well done Steve, and a big thank you to Toby Reeves for organising the tournament. Mason(right) is presented with a cheque shaped turkey for the winners prize.